Much less tannic from bottle than from barrel, the 2014 Cabernet Sauvignon Four Flags comes from four different vineyards on Red Mountain. 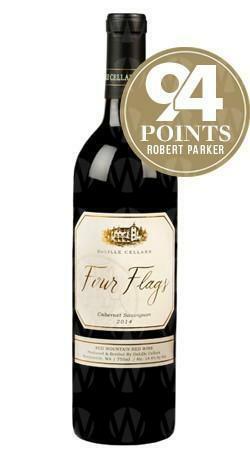 The 2014 Four Flags Cabernet Sauvignon exhibits classic Cabernet aromas of cassis, violets and Herbs de Provence. This wine screams of Red Mountain’s terroir with its combination of great structure and ripeness. Possessing lots of graphite, toasted spice, currants and black raspberry aromatics. Charming style with its full-bodied, rich, textured style, yet it firms up considerably on the finish. On the palate, Four Flags is focused and savory with ripe, firm tannins. This vintage shows notes of fresh plums, currants and blueberries along with cardamom, fennel seed and a touch of flint.